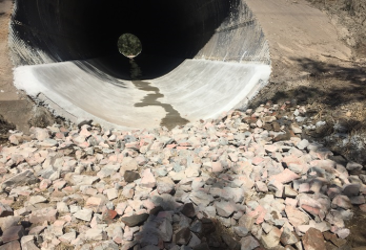 This project entailed major repair to a watercourse culvert supporting rail infrastructure at Whittingham in the Hunter Valley. 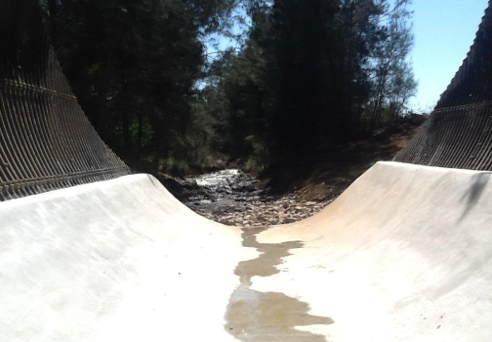 To achieve the scope firstly required controlling and diverting flow of a major watercourse before excavation of silt from the existing 110m long X 6m diameter corrugated structure. HCH then high pressure water blasted the structure and installed over 16 tonnes of fabricated steel reinforcing welded and tied into position. 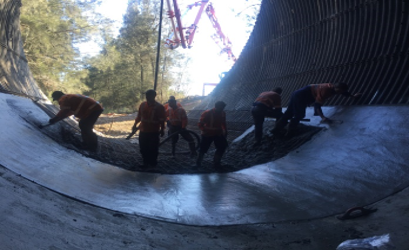 Next HCH carried out the placing and finishing of 180m3 of concrete shaped to the existing culvert radius for correct hydrology. Numerous areas immediately surrounding the site were protected Aboriginal Artefact sites. 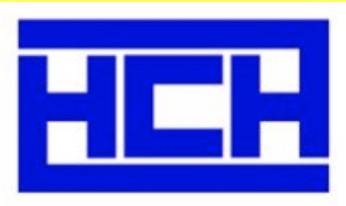 HCH liaised directly with the local Aboriginal Cultural Heritage officer to ensure at risk sites were identified and protected during the course of the project. This required major changes in methodology to enable scope to be achieved. Another significant obstacle was to establish a concrete mix design capable of meeting the near vertical finish required to radius the slab to design whilst also meeting engineering specifications for structural loading.